Chocolate and SunButter are combined with a crunchy twist to create these mini bites of goodness. 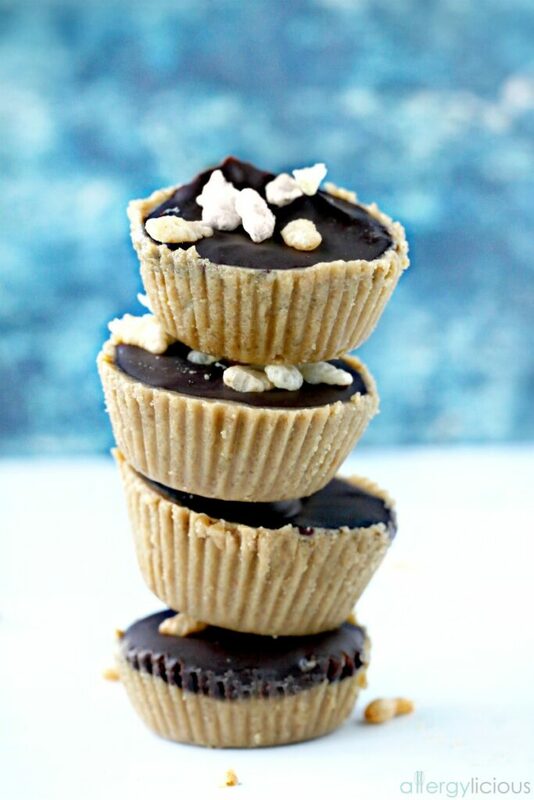 Several years ago, I created these Crunchy Chocolate SunButter Cups but today, I bring it to you, revived, refreshed and with a tasty little video to hopefully tempt you even more. And then there are these Crunchy Chocolate SunButter Cups! It’s like a party in your mouth with each bite. Crunchy SunButter & gluten-free cookies create a delightful, melt-in-your-mouth base, topped with creamy dairy-free chocolate…YUM! This would be perfect just like this but then a sprinkling of crispy rice cereal add another layer of crunch for that Oh My Goodness, factor!! To say we’ve been obsessed with this mini treats is an understatement…we like to eat them by the handfuls (don’t judge) and so will you! Would you ever have thought that hearing the word “NO” would be so wonderful? Don’t happen to have SunButter Natural Crunch? Use their Natural spread and just add in 1/8th cup of sunflower seeds or some more crispy rice cereal. We used Enjoy Life Foods’ Sugar Crisp cookies are part of the base, but Graham Crackers also work wonderfully. Keep this soy-free by using Earth Balance Soy Free Sticks , otherwise, use your vegan butter of choice. Are you ready to make awesomeness happen? 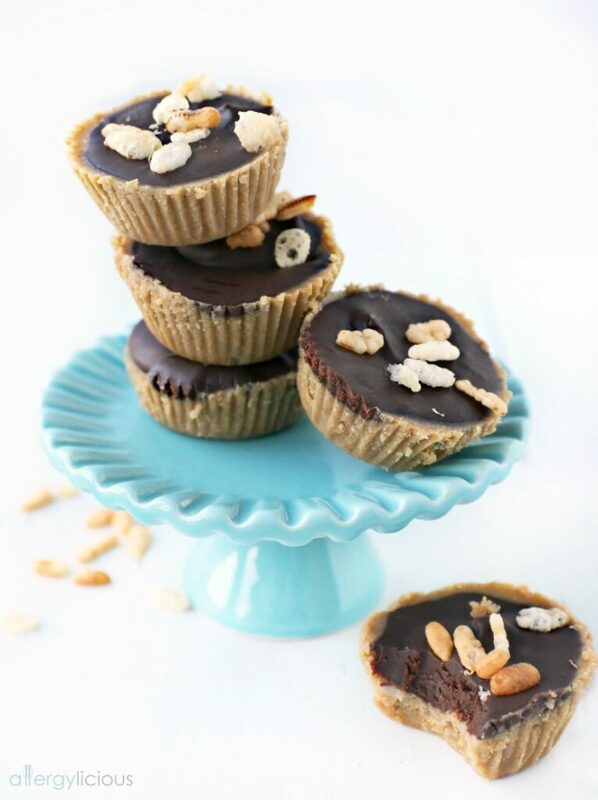 The perfect combination of chocolate & SunButter with a crunchy twist in these easy, no-bake, Crunchy Chocolate SunButter Cups. Line 12 regular or 24 mini muffin tins with paper liners, set aside. Place cookies in a food processor and pulse until ground into fine crumbs. Measure out 3/4 C and set aside. Melt the butter in a small pan on medium. Stir in the Sunbutter, cookie crumbs and sugar. Mix until well combined. Remove mix from heat and divide evenly in the prepared tins. Combine the chocolate chips and milk in a medium microwave safe bowl and heat in microwave for 1 minute and then 30 second increments until the chocolate is melted and smooth. Spoon chocolate over the Sunbutter mixture. Top with rice crisp cereal if desired. Refrigerate approximately 1-2 hours to set before serving. *If you do not have Sugar Crisp cookies, Graham crackers are a great substitution. **If you are out of crunchy SunButter, add 1/4 cup sunflower seeds to creamy version of SunButter. These look amazing! They’re so perfect for the holidays – for both treat boxes and for serving at parties! They would be perfect for treat boxes! I live for chocolate bites like these! I love the way you incorporated such simple ingredients. I love the idea of the crispy, crackly crunchies in this. 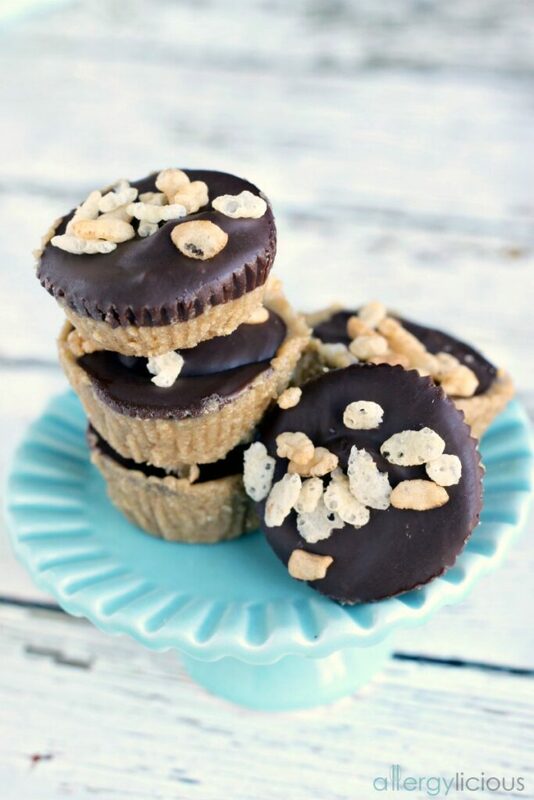 Sunbutter treats are our go to for putting a stop to that creamy, crunchy, chocolaty craving. I love the addition of cookie crumbs! 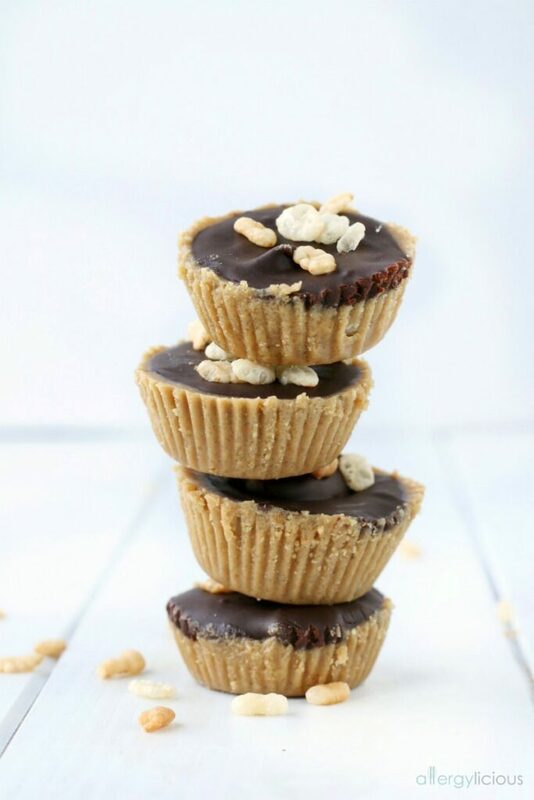 Such a fun twist on sunbutter cups. Love the crunchiness to these! What a great idea to add the rice crispy cereal in addition to the crunchy sunbutter. They look delicious. Reese’s Peanut Butter Cups were one of my favorite candies too. Thank you for this great recipe, I can’t wait to try it. These look wonderfully delicious! I don’t know who would love them more me or my kids. Audrey, that was a toss up for me too. I let my kids eat most of them, but mostly because I knew they’d run them off more easily! Thanks Kortney! Although I love creamy chocolate, it is fun to have a little crunch to change it up.